Awful carry on in Offaly. See uibhfhaili.com for more conspiracies and opinions on it. I wonder will Banty put his name forward for the job? Big Sam is free. Would suit Offaly.He even looks like a BIFFO. He'd put some fire in their bellies, that's for sure. I'm no fan of Wallace, his carry on in that club game with Mitchels recently is typical of him. He also left his own club and went to a bigger club (Kerins O'Rahillys) when they weren't doing great, so he's not my type of character. And his buffoon of a "coach" is even worse. That being said, IF it's accurate that the players all expressed their support of the management and wanted to drive on and pick things up, then what the hell are the board at? I think the likes of Brian Gavin (who is a hurling man anyway) have come across poorly here and it seems quite obvious that there are big problems with the leadership of Offaly GAA. The likes of AZ will know more than me on that. Maybe things would have got worse under Wallace, I don't know. This year is most likely a write-off now anyway. I feel sorry for the players more than anyone IF they are genuinely putting in a good effort. Edit: literally as I was typing, a mate text me about Wallace going on Off the ball this morning! Sacked and wants to go on National media - FFS. You would think he would go away and lick his wounds quietly, but no. Not his style. A bit of background. Brian Gavin is of course an ex-referee, but he is also an 'analyst/co-commentator' on Midlands Radio 3, and he is chairman of Clara GAA and a delegate to the County Board. Tommy Byrne has been Chairman of Offaly County Board twice at least, and in a previous stint he also was instrumental in a change of management back in 2003. It was after the first year of a 3 year plan, blooding young lads (including a young Niall McNamee) and Championship results were not bad. Lost to Laois after a very contentious last minute equaliser in O'Moore Park forced a replay (Laois won Leinster that year), beat London and Clare in Ennis in the qualifiers, and lost to a Frankie Dolan inspired Roscommon after Extra Time in Mullingar in Round 3. Tommy has form here. Since then, the instability has reigned, with I don't know how many managers since then. Pat Flanagan's treatment last year was unsavoury as well. On the other hand, there have been rumours of discontent in the camp. The player Alan McNamee tweeted about fell out with Wallace, and a few others have reported a general unease in the camp. The League was not good, barely stayed up by beating a disinterested Westmeath. The body language of the players on Sunday was not good or happy looking, so I think it's fair to say there was some level of tension in the camp, if not exactly what Brian Gavin seems to have described. Which brings me to my own theory. I think the Wallace incident in Kerry was embarrassing for the County Board, and not a good reflection on our senior manager. I think they knew some lads in the camp were unhappy (but not all, by any means). I think they'd have liked to get rid of him as soon as that broke, but they didn't want a player revolt if the majority still wanted him to continue with them. I further think that the performance on Sunday, allied to the unhappiness on the day of senior players gave them their opportunity, and Brian Gavin was primed to pump information into the media. They are not stupid, so by that spin getting into the media they knew it would garner national attention. They are now able to play two tunes on the same fiddle. 1 - Oh the players are unhappy, but let's not bring the players into this, they are not responsible for this, it's our decision. 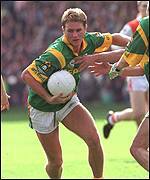 and 2 - The suspension and his behaviour in Kerry mean he can't fulfill his duties as manager. I think #2 is the real reason, as well as an embarrassment that this man is the figurehead of our senior team, and he's below in Kerry boxing the heads off lads at a club game. As with everything in the GAA in Offaly there appears to be enough blame to go around. I give Tommy Byrne and the County Board very little credit because of their previous behaviour in relation to managers, but likewise I think Stephen Wallace has done himself no favours, and to be honest the Kerry issue probably does make his position untenable in reality. He can't attend training, he can't be pitchside, and he can't do video analysis with them. His appeal only finished on Saturday evening, so you're looking at another 6-8 weeks of that sort of mess. I don't think the players are completely blameless. We have a lot of X and Y are unhappy etc, seemingly every year, and I don't know what manager doesn't fall out with some players at some stage. But I think of the 3 parties here, the players are the least to blame. By all accounts they are a dedicated bunch, and they have largely kept their counsel since Sunday, apart from Nigel Dunne himself rubbishing some of the sensationalist parts of Brian Gavin's account. This 'leak' of the letter is suspicious too, but even at that, it's not the typical scenario in these circumstances, it appears to be supportive of management, and it does appear the County Board have unilaterally made this decision. Thanks for that synopsis lad. Very messy and nobody blameless really so. Wallace is a clown, no 2 ways about it. Some of his antics on the line in recent years with IT Tralee even before this latest episode with Ardfert his club - well if I was involved in making the decision to appoint him Offaly manager and word reached me of them (which you'd imagine it should have?) then I would have thought twice about appointing him in the first place. Then when he brought a spoofer with him to take most of the sessions (Sheehan) I would have been even more worried. Does however seem like a Co Board that aren't operating to a high standard either I think it's fair to say? I know players should be possibly doing better anyway but it's hard to get 100% when that kind of atmosphere is there. I've seen it on an even greater scale in Cork. People say "ah the Footballers are sh*t"..but while the hurlers are training in proper gyms and on all-weather pitches, the Footballers are having to build their own gym in a dank warehouse in a town 2 hours drive from where some players live. Double standards, sneakiness and underhanded activities then become part of the narrative - much like the Offaly board sending out Gavin to get the narrative they want into the public domain. Sickens me to see that kind of stuff anywhere when players are breaking their b*llix training. In fairness to the CB, they have done good work on the facilities front. The Faithful Fields was a visionary project, and is a brilliant facility. It looks the business from the roadside, and the pitches are lovely. Apparently the facilities in there are good as well, gym etc. Their record of sticking with managers, or supporting them, is far weaker however. I'm not sure if it's the personalities involved or what, but they have a real blind spot when it comes to backing managers, or picking the right ones to begin with. They obviously don't pay massive 'expenses' so perhaps the big names are out of their league, but they seem to fall between two stools. Don't pick a big name, and pick lads with 'projects' and then when there's a setback, bottle it and get rid of him. They went after Jack O'Connor who was the one who put them onto Wallace. The spiteful so and so. Seriously, I don't think they'd be in the league for Jack. That was organised by Kieran Keenaghan, Duignan, Colm Cummins, Sod Daly, etc. They went around getting money from companies such as Grennan’s and Banagher Concrete.